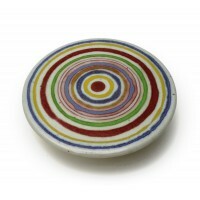 Trivet with blue, yellow, red, green and reactive glaze decoration in bands, on a white ground. A target pattern trivet. Good for cutting cake and cheese too. 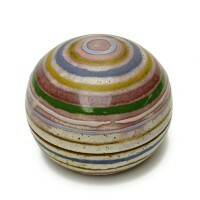 Size: 9½" Diameter x 1¼" Height. This pot is Standard Ware and can be ordered at any time. Lead time up to 6 weeks depending on stock levels. 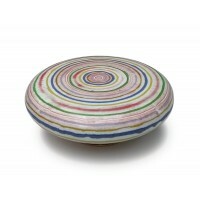 Because these pieces are individually made, shapes, sizes and glazes may vary. 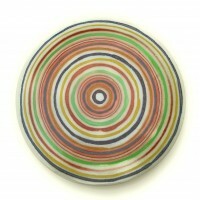 Trivet with blue, yellow, red, green and reactive glaze decoration in bands, on a white ground.A target pattern trivet. Good for cutting cake and cheese too.Materials: Stoneware Clay - Food safe glazes.Care: Stoneware. 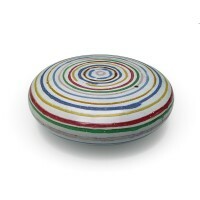 M..
Trivet with blue, yellow, red, green and reactive glaze decoration in bands, on a white ground. 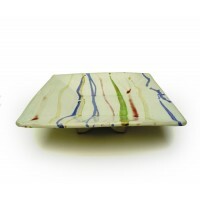 Excellent for presenting cake or cheese too!Materials: Stoneware Clay - Food safe glazes.Care: Stoneware. Microwave/Dishwash.. 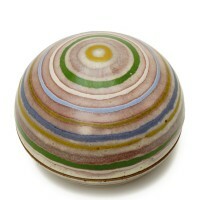 Box with blue, yellow, red, green and reactive glaze decoration in bands, on a white ground.Features a neatly fitting lid. 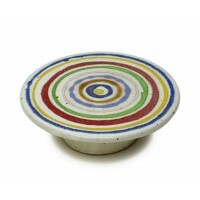 Suitable for food use or treasure box.This Box is 2.5" height x 4" diameter.Care: Microwave/Dishw.. 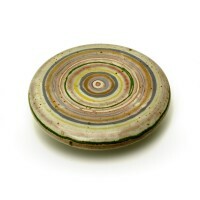 Box with blue, yellow, red, green and reactive glaze decoration in bands, on a white ground.This Box is 9.5cm height x 12cm diameter.Care: Microwave/Dishwasher safe.Materials: Stoneware Clay - Food Safe Glazes.Suitable f..
A press moulded stoneware dish with bands of multi coloured glaze decoration.This dish is ideal as a serving bowl - for salad or snacks, or as an individual bowl for big eaters. 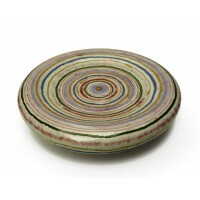 Materials: Stoneware Clay - ..
Cake Stand/Cushion with blue, yellow, red, green and reactive glaze decoration in bands, on a white ground.This Cushion pot is suitable for use as a food stand. 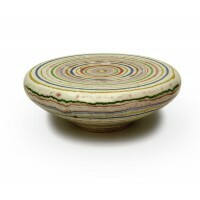 It is very good for giving lift to a cake or fruit and make..
A hand thrown stoneware trivet with bands of coloured glaze decoration.Useful for protecting the table from heat or for cutting onto for cheese or cake. It has a strong target design which draws the eye. 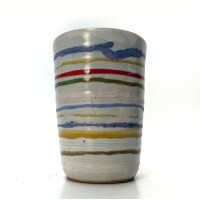 A visual focus for a ..
Beaker with blue, yellow, red, green and reactive glaze decoration in bands, on a white ground.Hand thrown beakers with signature decoration applied with glaze trailers on the banding wheel. Each one is unique.Care: Oven.. 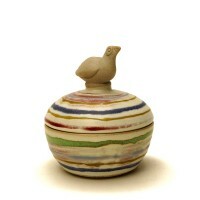 Box with banded decoration and bird on lid Features a neatly fitting lid. 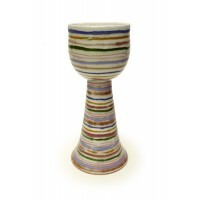 Suitable for food use or treasure box.This Box is 3.5" height x 4" diameter.Care: Microwave/Dishwasher safe.Materials: Stoneware Clay - Food Safe ..
Goblet with blue, yellow, red, green and reactive glaze decoration in bands, on a white ground. 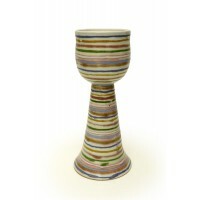 A hand thrown stoneware goblet with bands of coloured glaze decoration. Each one of these goblets is a unique, one of a kin..